Patented 45° angled bristles and sonic technology clean beneath the gum line while polishing and whitening the tooth enamel. Promotes naturally whiter teeth and healthier gums. 30,000 Sonic Strokes Per Minute. Interchangable Brush Heads with 45° angled bristles. 3 Brushing Modes: Clean, Gentle and Pulse. Our patented 45° angled bristles and sonic technology clean beneath the gum line while polishing and whitening the tooth enamel. Promotes naturally whiter teeth and healthier gums. 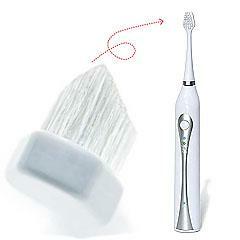 For best results, place the brush head so that the center row of bristles is positioned between teeth and gums. Move brush in small circles for two minutes twice daily. Stand toothbrush upright for hygienic drying. Replace toothbrush head every three months. Box contains: 2 45° angled brush heads with soft polished nylon bristles, 1 charger and 1 Series II LS45 degrees Advanced Sonic Pulse™ Toothbrush handle.